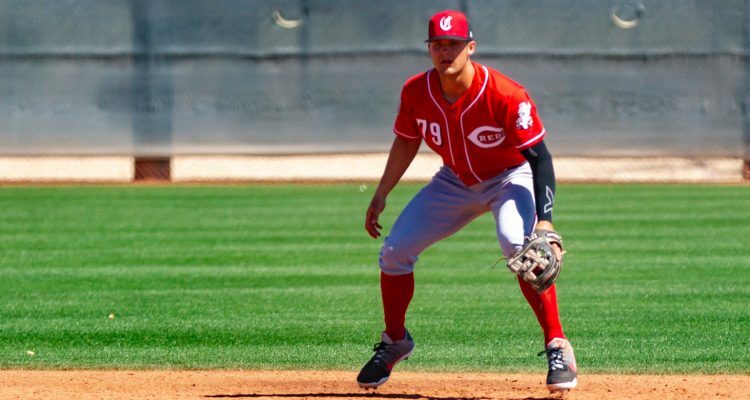 Should the Reds sign Nick Senzel long term? If you listen to the Redleg Nation podcast you heard this question posed in the latest episode. If you don’t listen to the Redleg Nation podcast, what are you thinking? Go subscribe to it right now. During the segment of viewer mail, the question was asked to Chad and Bill if the Cincinnati Reds should sign top prospect Nick Senzel to a long term deal right now. Chad and Bill were split on the decision, but more on that later. Nick Senzel has not played a single inning of Major League Baseball. He’s only played about half of a season of Triple-A baseball. That half season was pretty darn good, though. The then 22-year-old hit .310/.378/.509 for the Bats in 193 plate appearances to go along with eight steals. By just about any measure, he’s ready to play in the Major Leagues right now. He was ready to do that last year. 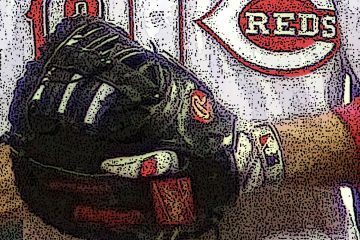 But back to the question at hand: Should the Cincinnati Reds sign Nick Senzel to a long term deal? There are some pros and there are some cons. Let’s start with the pros. You get to lock in set prices moving forward, making it a little bit easier to forecast your payroll in the future. There’s not much worry about service time and manipulation. It likely sets up Nick Senzel with enough money for the rest of his life and then some. It probably gives the Reds a bit of a discount, and a lot of one if he turns into an all-star caliber player or better. He’s completely unproven in the Major Leagues. He’s missed parts of each of the last two seasons with complications to due vertigo. The pros list certainly has more on it than the cons list. But that doesn’t mean there isn’t some risk involved, either. For both the Reds and for Nick Senzel. To dive into the risk, we need to look at contracts signed by players before they reach the Majors or almost directly after they made their debut. The list is pretty small. It began with Evan Longoria just over a decade ago. In 2008 he signed a deal for $17.5M for the first six years of his career. That deal also included three option years after that worth $7.5M, $11M, and $11.5M each. Longoria was a similar prospect to Nick Senzel. He was the 3rd overall pick in the draft in 2006, and a top 5 prospect in all of baseball. He was a tad younger than Nick Senzel is today when he signed his deal – but by less than a year. Last year the Philadelphia Phillies signed one of their top prospects, Scott Kingery, to a contract before he ever played in the Major Leagues. He had been a second baseman in the minors, and was about to turn 24-years-old (he did so in April of 2018). Kingery was ranked in the 30’s heading into the year, so he was a very good prospect, but not quite on par with Longoria or Senzel. He signed a 6-year deal worth $23M. Like Longoria, his deal also included three option years. His were worth $13M, $14M, and $15M each. There’s a $1M buyout on that first option year, but not the others. 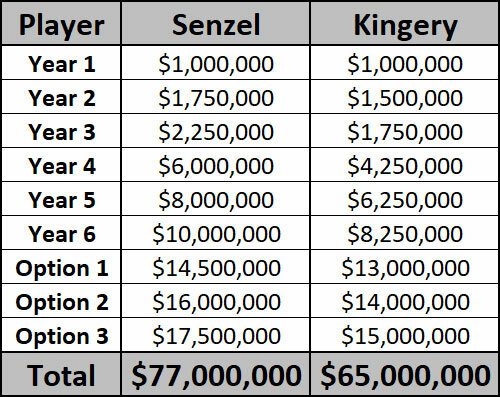 With Nick Senzel being a year younger, and more valuable as a prospect than Scott Kingery was entering the contract, you probably have to pay him more. Perhaps you have to make the second and third options mutual options. The framework, however, is there. Let’s get back to some of the risk here from the team side of things. Look at the deal that Scott Kingery signed last spring before ever playing a Major League game. Last year he hit .226/.267/.338 in 147 games for the Phillies. He was worth -1.4 WAR or -0.1 WAR depending on which version you prefer. Either way, though, he was very, very bad. And that didn’t hamstring the Phillies in terms of payroll, but it also meant that they kind of felt the need to not send him to the minors when he was clearly in over his head. His Triple-A performance the year before wasn’t like that of Nick Senzel. He wasn’t nearly as good, showing questionable strikeout-to-walk ratios and posting a .786 OPS in half of a season. And prior to 2017, he had never hit anywhere he had ever been as a professional. But he was a former 2nd round pick out of college and had the pedigree. The Phillies gambled that his 2017 was real, and at least for 2018, they lost. And they lost big. That’s a lot of money they owe to someone who just posted a .605 OPS in the Major Leagues. He’s young, and it’s still early in his career, but they probably aren’t feeling great about it right now, either. For Cincinnati, at least in terms of expected production, they probably feel better. Outside of his two weeks spent in Billings after not playing for a month after the draft, Nick Senzel has raked everywhere he’s been. He’s a career .314/.390/.513 hitter in the minors since being drafted. There are zero red flags on his resume when it comes to performance. The uncertainty, however, could be with his health. While his 2018 season did end because of an injured finger, and he ultimately lost out on playing in the Arizona Fall League because he had elbow surgery to remove bone spurs, it’s the vertigo that is the most concerning. Nick Senzel has stated that he and his doctors have a plan in place that will take care of it moving forward. I’m not a doctor, and won’t pretend to be one. But his 2017 season ended with two weeks remaining because of vertigo complications. And he missed nearly all of May in 2018 with complications due to vertigo, too. The finger injury? The elbow injury? Those shouldn’t be concerning. The vertigo issue, however, should at least be slightly concerning. Personally, if Nick Senzel would sign the contract proposed above, I’d get it printed and in his hands quicker than I typed this sentence. The risk against his vertigo being that huge of a problem is 100% worth it. He’s as safe of a prospect as the Reds have seen since at least Johnny Cueto, if not longer. That, however, doesn’t mean that Senzel would accept it. If I were him, I’m not sure that I would. I’d consider it, though. There’s a lot of uncertainty in the free agent market right now. Teams are skewing younger and younger. Would the next collective bargaining agreement change how players are paid? By that time Nick Senzel will be beyond his “truly cheap” contract years. And he could have some big money at the back of his deal in a new time where guys aren’t getting that into their 30’s anymore. But, that deal could also leave Nick Senzel entering free agency as a 30-year-old (who would turn 31 in his first season of a new contract at the mid-way point). It could leave him with a chance to still cash in on free agency of sorts, no matter what. There’s a lot going on here and you could see how it could play well for the player and the team. No. I would try to keep a strict rule, no extensions until their second full season in the majors, to make sure their rookie season wasn’t a fluke. No way ….WAY to much risk to spend that kind of money that far out with someone who is injury prone and has a medical condition that will likely never be cured. The astros had one, jon singleton if i am not mistaken. By far, the main “pro” of the proposed contract is three extra years of Nick Senzel. The other stuff, from the club’s perspective, is pretty trivial and could likely still be gained after waiting a few years. Under this contract, Senzel would be a free agent in 2028 for his age 32 season. Normally, you’d think he wouldn’t want to give up those critical three years of free agency for team options. But with the nagging health concern, he might go for the multi-generational financial security. If I were the Reds, I’d wait a couple years, or at least a year. Pretty good chance the same deal would be on the table. To Steve’s point, I think you maybe look to lock up Winker with this type of deal. We’ve seen him rake in the majors – his production was ridiculous last year – and despite the injury concerns(? ), Winker would be worth every dollar of that type of contract. This is probably a good question for this time next year. The Kingery contract should be a cautionary tale. 1. Let’s see if he can get a whole season of 162 games in first. 2. You are actually proposing giving him a better contract than what Suarez signed last year, without ever playing an MLB inning? And that was signed after Suarez had played 2+ seasons. 3. Three options are a bit much, so maybe 2 at most. That slices off the most expensive year. Suarez should have never signed that deal. Yeah, I know, the 20/20 hindsight thing. But Suarez and his wife were having, or already just had, their first child, a baby girl. So I can understand his position on signing at that particular time. I think Barnhart also signed his extension when his wife was pregnant. I guess you can look at it in different perspectives. Maybe the Reds decided to take care of their players whom they thought could be around for several years. Or maybe the Reds took advantage of the situation and offered good, but below market value contracts to players just as the players were starting families and offered lifetime security with those contracts. Just 1 year later and Suarez would be looking at about $30MM to $40MM more on the same type of deal. Timing is everything. He and his agent (and Octagon represents a fair # of players) thought it was fair. Personally, I think it is quite admirable that he signed a contract that was good for the team, brought multi-generational wealth for him and his extended family if he chooses that path over taking the risk of waiting for free agency for what may or may not be a bigger payday. Contentment is a rare virtue, today. I’m with Steve on this … wait a year and see how things play out. Unless you swing a deal that moves Scooter before ST opens, I’ll pass. Now, if you move Scooter and 2B completely opens up, then you can consider it under the proposed model. In that case, I’m inclined to go with WVRedlegs on point #3 and only do 2 options. Another important factor will be the ending of the current CBA. undoubtedly a big change will come to the way free agency/arb is done. I say see him for a season and then get him locked up before the CBA expires. Of course if i am nicks agent i tell him absolutely not until after the CBA. After reading this article, it makes me realize just how team friendly of a contract Suarez signed. “Viewer Mail”? Have bowed to the pressure? Be Strong. We must keep up the Resistance ! Jason is the “hardliner” about it not being “viewer mail”, if I’m not mistaken. I’d say it’s too early. I agree with those who suggest waiting a year or two before considering this. Now, if they want to start discussing locking down Castillo, then I’m interested. 1. Listener Mail, we do not view anything. 2. If I where him, I would sign that contract now. 29 Mil guaranteed? 3. If I where him, and had a good year, without the vertigo, NO WAY I sign it. PS, I am not him, and will not make year 3 money in my life, so my prospective is different. When I looked a deven, homer, etc it seems to be a fair risk for both sides. 1. I’m with you, but Chad calls it viewer mail because he’s weird. To Matt’s point, the expiring CBA should factor in to Senzel’s thinking about signing. Perhaps opt-out after 2021 or 2022, to take advantage of any new wrinkles. However, this piece is a reminder of how badly broken MLB is under the surface. Record profits, but declining attendance, declining World Series TV ratings, longer games with now more strikeouts than hits over an entire season. Players with little recourse than to sign away upside potential for financial security early in their careers….if they even make it to MLB. Minor leagues are a travesty. On Friday, we will be exactly 10 weeks from the true start of the regular season, and so far, neither Harper or Machado have signed. Nor Kuechel. Compare it with the frenzy of NBA Free Agency on July 1. Takes over sports media. The MLBPA should play up the growing “Baseball is Broken” theme in the run-up to the CBA negotiations. Public awareness might help them drive some real change. I’d feel much better about that contract if it was paired with an insurance policy for vertigo-related missed time. The niche insurance industry on large baseball contracts seems to be pretty vague, it would be interesting to get some info on how expensive those types of policies are and how prevalent they are team by team. It was my understanding that the Reds purchase insurance on contracts longer than 1 year. This came out when Ryan Madson (shakes fist at sky) signed a 1-year deal and then promptly got hurt. The Reds did not have insurance and were out something like 8 million. Not sure of the payout, though. The team won’t ever talk about this, but I’ve heard that they didn’t have it on some other contracts from secondary sources. So I wouldn’t be so sure that they are buying insurance on hardly any contracts that aren’t Joey Votto. I think the Astros were the first team to try something like this. They signed Jon Singleton to a contract before he ever played a game, $2 million a year for five years with three team options later on for another $20 million. I think he was suspended for drug use multiple times and was eventually released. I am not saying Senzel will be out of baseball in three years, but there is risk for both sides on these types of contracts. Overall the Astros lost some money for a guy who didn’t perform, but if he had become a star he would have missed out on some money in arbitration raises and free agency. Everyone on here stating that the Reds should wait a year to see if Senzel is a fluke don’t understand economics. Buy low, sell high. This offseason likely represents the nadir of Senzel’s value. If he isn’t a fluke and stays healthy then you his value only gets greater. Additionally, any extension likely means he gets to the big leagues sooner as there would be fewer service time considerations for the Reds to consider. 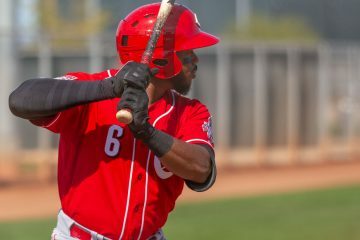 The Reds need to decide whether he’s a big league-caliber player and if his health will hold up. If they think both are true, then they should work to get a deal done. Waiting only increases his bargaining power while likely removing the team-friendly options the last few years of a deal (I wouldn’t agree to any deal with mutual options, if he turns into the kind of player where the contract works out well then he’ll decline them and the Reds would lose the most valuable years on the contract). If I’m Senzel, I wouldn’t accept any offer right now and would want to bet myself. But after a frustrating and injury-plagued season, he might value being set up for life more than the possibility of a much bigger payday. Additionally, the market has evolved the past few years where non-superstars don’t seem to be getting paid as much as they once did. If settles in as a solid starter (think .270/.350/.425) there’s no guarantee that a big contract is coming his way. I’d wait a year to offer him a long-term deal. And I sure as hell wouldn’t trade him for Kluber or any other 33 year-old. Who was Kingery’s agent? The player makes the ultimate decision up different agents are likely to give different advice depending on the agent’s perspective. I would not be upset if the Reds offered that contract, although I agree probably should wait a year and see how healthy he is in 2019 a least. If I were Senzel I would sign, that is 6 years of guaranteed money, more than I would probably makeover through arbitration. Then the possibility of 3 more years of money. I probably would like that last year to be a mutual option or player option. I think Senzel is a Boras client, which may make this exercise moot. Scott Boras works for the player. The player does not work for Scott Boras. Think of it as a symbiotic relationship. But doesn’t everyone know what Scott Boras is about? Why hire him just to pursue a negotiating strategy that he almost (weasel word because I haven’t looked it up, but I can’t recall any off the top of my head) never takes? The long term solution, if we keep all 3 players ,is to move Suarez to first base. this really “opens up the infield” for Senzel and India. Yes I know this means you have a 20 million dollar bench player but who cares. A 20 million dollar bench player, who had a better season then any other reds player last year. No way on benching votto. India is a September 2020 call up at the absolute earliest. 2021 realistically and 2022 if there are any holdups like an injury. You want someone to bench it has always been peraza. Give him a year and trade him in nexts years “we didnt see it comming trade”. The FO has already indicated it is not going to make the same mistake with India and he will play all positions in the field while in the minors. Benching our best player….and yes puig will give him healthy competition this year, is extremely dumb. who is our ss if we dump Peraza? I actually like the idea of Hunter Greene because of his athleticism. but the reds don’t seem to be interested in trying him there. Because hunter green was given the choice….he was even given a stretch as a 2 wayplayer and said he wanted every 5th day. Ultimately India would be, after training in the minors for it. As far as until then a one year rental. I’m old(er) and I keep thinking back to Nick Esasky. I know what the doctors say about the vertigo but again, I keep thinking about Nick Esasky. I’d like to see at least one full season from Senzel before offering any kind of long term contract. Vertigo cases are all different. I actually struggle w/ vertigo from time to time, BPPV specifically. I haven’t had a serious issue that lasted more than a few minutes in 3 years or so. I didn’t have this issue at all while playing ball but feel that if I had to, there would have only been a few weeks (8-10 maybe) out of the last 10 years where I would have been unavailable to play and over the past 3 years, I don’t think I would have missed any games because of vertigo. I haven’t missed any work in the last 3 years because of it. Assuming Boras wouldn’t go for the above deal, think I’d do a similar deal but with WAR escalators that kick in what would be his arbitration and option years. I’d try to make it as performance based as possible. Interesting thought piece, I’d think both the Reds and Senzel would do well to wait this out for a while. The Reds would have to be super confident before making this type of commitment for a player that has had a tough time staying on the field and has yet to get an at bat in the majors. I say there is no harm in waiting to see how Senzel does at the MLB level. He is not likely to make himself significantly more expensive than projected here (except in the extremely unlikely scenario he comes in and puts up Mike Trout numbers out of the gate), and if anything the price may go down some as he’ll be a year older. Let’s see what the kid can do in the big leagues before there’s a rush to lock him up for the next 10 years. Another year won’t make that much of a difference.